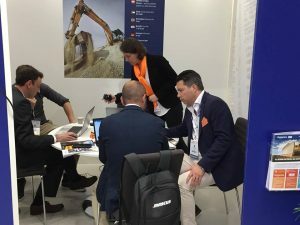 This year, the visitors of Intermat Paris were greeted at the joint stand of Mascus, Ritchie Bros., IronPlanet and Marketplace-E and presented with the most complete offering in asset disposal the heavy machinery industry knows. With the acquisitions of Mascus – the online listing service, IronPlanet – the online auction marketplace, and the launch of Marketplace-E – a daily online buying and selling solution, Ritchie Bros. has been focusing during the past two years on embracing online technology and delivering choice to its customers whether they are looking to buy or sell used heavy machinery. “Commercially speaking, the world has become a marketplace accessible to anybody connected to the internet and e-commerce has made it easy for companies to be visible globally and reach out to new potential customers. Nowadays, if you are looking to buy something, whether a car, a house, or book your vacations, there is a high probability that you will start your shopping journey by opening your phone and typing in your request in a search engine; the heavy machinery business is no exception” says Gauthier Dominicy, Chief Marketing Officer at Mascus. With more than 2.5 million unique visits from buyers every month, Mascus helps 6,000 clients (dealers, traders and OEMs) mainly located in Europe and North America to connect with buyers locally and globally. Over the past 12 months, the website has delivered 370,000 buying leads to its clients (emails) of which 20% were coming from Africa, Middle East, Asia and Latin America. During Intermat Paris, Mascus has received a lot of positive feedback from its clients in regards to great results of the listing service delivering quality buying leads, which often turn into deals. Ritchie Bros. and IronPlanet auctions have also witnessed over the years a significant increase of bids coming from online buyers from every corner of the globe. “We hear these great stories where our clients are at the harbor loading equipment on to a ship going halfway across the globe; a new life begins for those machines and we are proud to have connected these people and helping these companies” says Francois Guys, Country Manager at Mascus France. The Intermat Paris show was also a great opportunity to introduce to sellers of used heavy machinery the multichannel concept formed by the association of Mascus, Ritchie Bros. and IronPlanet auctions, and Marketplace-E.
“For the past few months, we have been working on connecting the dots between the different solutions the group has to offer. We want to make it easy for a Mascus client, if he wishes to do so, to send equipment in a few clicks to an auction organized by Ritchie Bros. or IronPlanet or even to list equipment on Marketplace-E the daily online marketplace with reserved price. We have been building and delivering “Inventory Management Systems” for many years where companies can manage their stock internally with confidential information and publish listings to different channels such as Mascus or their own web shop. By adding a new feature to this tool we want to offer a new channel to transfer equipment towards an auction. I want to highlight the fact that Mascus remains an independent brand and does not share information with the other companies within the group but we want to facilitate the transfer when and if requested by our customers” says Tim Scholte, Mascus CEO. Following Mascus’ presence at Intermat Paris, the international exhibition for construction and infrastructure which took place from 23 to 28 April 2018, we’ve gathered some impressions from our Mascus representatives at the fair. Francois Guy, Country Manager for Mascus France felt right at home at Intermat and grateful for the chance to meet in person with a lot of clients from France. Although most attention at the fair was naturally directed towards new machines and innovations, the used equipment business also got its fair share of interest at Intermat. “As the shortage of used machines continues, our customers rely on the Mascus platform now more than ever and see it as the best solution to find quality machines at a good price”, explains Francois Guy. With this purpose in mind, Mascus always strives to bring large manufacturers and their dealers and stocks on our platform, some of the latest ones being Manitou and Yanmar Construction Equipment Europe. We were also proud to hear great feedback from our satisfied French clients: Bergerat Monnoyeur, Sodineg, Sami TP, Codimatra, Best Machine, and Z’Mat. Saki Aro of Mascus Finland was also present at Intermat as part of the international team representing Mascus. He had promising meetings with important companies like Junttan Oy (large manufacturer of hydraulic piling equipment) and Bronto Skylift (global market leader in truck mounted, hydraulic aerial platforms) and other smaller companies. “The multichannel solutions we can offer together with Ritchie Bros. and IronPlanet are interesting to the bigger companies especially, as they get access to a wide range of choices in selling their stock.” says Saki Aro. Luca Perlati, our Mascus Italy representative is already a veteran of Intermat. This was his third participation at the event. He was pleasantly surprised to see so many exhibitors from outside Europe, especially from Turkey and China. And interested visitors were very open to the joint business message delivered by our multichannel stand and brands. Visiting Italian exhibitors such as Merlo was a priority on his fair agenda. He even had the pleasure to meet and exchange opinions with the founder of the company Mr. Amilcare Merlo. Additionally, he met with our client Case Construction and discussed about upcoming developments of our partnership, and also presented Mascus services to Doosan Europe. “For me Intermat 2018 was really important because it gave me the chance to meet all European decision levels in the same place and to continue business discussions that had started last year. I hope to collect positive results soon.” he stated. See more photos from the event on our Facebook page.